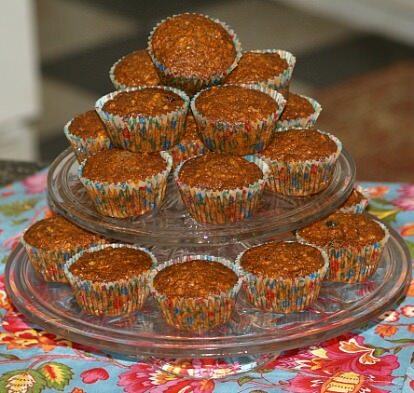 When you learn how to make carrot muffin recipes, they can be incorporated into any meal of the day. These warm fresh quick bread muffins from the oven will be a sure pleaser for family or friends. They can be great for breakfast, mid morning snack or even as a light dessert; or pack a couple for the road. When you are learning how to make carrot muffin recipes, the batters are usually stirred so that they are not over mixed. The wet ingredients can be creamed and then the dry ingredients are stirred into the wet ones. The carrots in these recipes help to make them much moister than a lot of other recipes. By combining the carrots with other ingredients like cinnamon, ginger and other spices make these very delicious in taste. I am not sure who learned how to make carrot muffin recipes first, but I know that carrots have been used in baking for centuries in many parts of the world. Way back before sweeteners were available carrots were added to recipes. Because of the sugar content in carrots, they would add a little sweetness. After World War II, a stockpile of canned carrots were left here in the United States from the war rationings. People would use them any way they could for cheap food. I have heard that the taste was not very good, certainly nothing like the fresh or frozen which we have today. By adding them to the baking recipes, they improved the flavor and texture of the baked goods, especially the carrot cake and muffins. Paper line or grease 2 ½ inch muffin pan. Combine carrots, zucchini, oats, milk, egg whites, oil and vanilla in a medium size bowl; let set for 5 minutes. In a large bowl combine the flour, sugar, baking powder, cinnamon and cloves. Add the carrot mixture to the flour mixture stirring only until moistened. Bake 20 to 25 minutes or until pick comes out clean. The following of the carrot muffin recipes will make 75 miniature muffins. These are great as an addition to any meal, for breakfast or any buffet. Of course, you can make them in any size muffin that you like. Use paper liners or lightly grease miniature muffin pans. In a large bowl sift together the flour, sugar, salt, soda, and cinnamon; stir in the carrots, currants, pecans, coconut and apples. In another bowl combine and mix the eggs, oil and vanilla. Stir egg mixture into the flour mixture only until moistened. Spoon batter into prepared miniature muffin pans; filling to top. Bake for 30 minutes or until pick comes out clean. Many requests have been made for the “Morning Glory Muffin Recipe”. I have two. They are both delicious but are a little different. I have traced this muffin to many famous restaurants and the Mayo Clinic but I have no idea where they originated. Use paper liners or grease muffin pans. Add the eggs, oil, vanilla and apples; stir just until moistened. Bake for 20 minutes for 2 inch muffins and 15 minutes for mini muffins. Combine and beat together the eggs, oil and vanilla; set aside. Sift together the flour, cinnamon, soda, salt and sugar. Add the carrots, raisins, pecan, coconut and apple to the flour mixture and stir to blend. Add the egg and oil mixture to the flour and carrot mixture; stir only to moisten. Fill batter to the tops of the muffin cups and bake about 35 minutes or until pick comes out clean. This is a crowd size recipe making 50 regular size muffins.